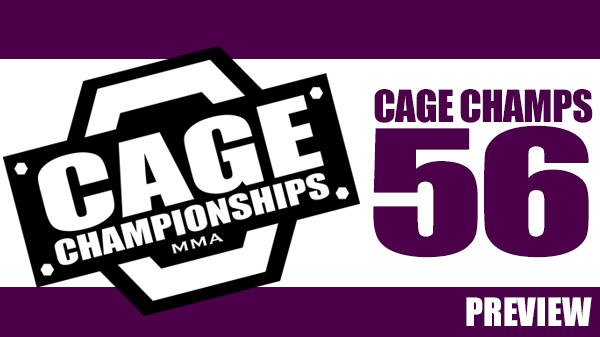 Cage Championships is back in Sullivan on Saturday for Cage Champs 56. One of the longest running mixed martial arts promotions in the area, Patrick Smith's production returns with a solid all-amateur offering that features local favorite Denver Sells back in the cage to take on Jeremiah Curtright as well as many of the Cage Champs regulars getting back to work. After a nearly three-year layoff for military duty, Jeremiah Curtright returned with a bang, scoring a blistering 26 second KO of Toby Gvillo at a Shamrock FC event last July. He followed it up with a second-round TKO in the fall to improve to 2-0 since reappearing on the local circuit and joining up with St. Charles MMA. Sells has been on the shelf since March of 2015 when he defeated Tracy Garland with a first round TKO at Cage Champs 51. Before he put down the gloves, Sells was considered by many as one of the top prospects in the region, with impressive wins over Jesse Geringer, Shaun Scott, and Carl Jefferson on his resume, and a memorable clash with Tyler Flores in the fall of 2014. Sells drew comparisons to teammate Jake Collier and seemed poised to follow the same trajectory before hanging them up for a spell. It'll be interesting to see if this is a one-time outing or if he's back for good. Curtright's teammate Clayton Whaley will face Josh Easterly. The 6-foot plus Easterly should have some height and reach on Whaley and had competed at light heavyweight previously. Whaley has steadily improved while under the guidance of Mike Rogers and should be evenly matched against Easterly. Colton Carmack faces David Stitt in a lightweight affair. Carmack has won two of his last three, with the last being a very close decision loss against James Cowan at Cage Champs 55 where Carmack threatened with submissions throughout the three-round encounter. Stitt has also won two-of-three and has competed primarily for Midwest Fight League in the central part of the state. Another Cage Champs regular Cody Winistoerfer will face Mikey Griggs. Winistoerfer has shown moments of sheer brilliance but has had trouble keeping consistent. Trained primarily by John Davis, Winistoerfer has since relocated to the Smith Pit for most of his prep work. Griggs has competed mostly in the Columbia/Jefferson City circuit and has won two of his last three fights. Also on the card is amateur boxer Jimmy D'Angelo, the husband of undefeated local pro Kelly D'Angelo, the former Cage Champs women's champ and a recent RFA vet. D'Angelo has joined his wife training MMA and jiu-jitsu at St. Charles MMA. Local pros Lucas Clay and Dakota Bush will compete in an exhibition grappling match.